Jones v. The Toro Company (2001). Workers’ comp retaliation. Jury Verdict $30,475,000. The Jones verdict was included in the National Law Journal’s Top 100 Verdicts of 2001, and was the largest single plaintiff employment verdict in the nation. McClaren v. Morrison Management Specialists, Inc. (2003). Age discrimination. Jury Verdict $10,400,000. National Origin Discrimination. Jury Verdict $5,804,109. King v. WT Lighting Corp (2002). Age discrimination. Jury Verdict $2,269,844. Richardson v. The Eureka Co. (2005). Gender discrimination and retaliation. Jury Verdict $1,907,051. 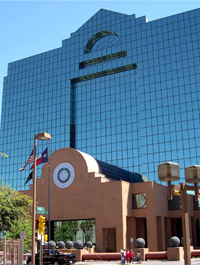 Carmona v. El Paso Healthcare Ltd. d/b/a Las Palmas Medical Ctr. (2002). Age discrimination. Jury Verdict $1,614,488. Edwards v. Aaron Rents (2006). Gender discrimination. Jury Verdict $1,413,000. Jackson v. Host International, Inc. (2009). Age discrimination and retaliation. Jury Verdict $983,500. Vielma v. ACC Holdings Inc. d/b/a Air Cargo Carriers Inc. (2013). Age discrimination. Jury Verdict $690,060. Monarrez et al v. Ysleta Independent School District (2000). Gender discrimination. Jury Verdict $503,000. Breaux v. US Dept. of Treasury (2000). Race discrimination. Jury Verdict $500,000. Yates v. MCI WorldCom (2002). Race discrimination and retaliation. Jury Verdict $375,000. Ortiz v. SCM Management (1999). Workers’ comp retaliation. Jury Verdict $362,500. Strickland v. Aaron Rents (2005). Gender discrimination and retaliation. Jury Verdict $275,530. Edwards v. Age Industries (2007). Breach of employment contract. Arbitration Award $268,833. JNR v. Readyone f/k/a National Center for the Employment of the Disabled (2008). Disability discrimination. Arbitration Award $261,233. Juhl v. R.M. Trust (2002). Breach of Contract. Jury Verdict $252,625. Sexual harassment. Arbitration Award $125,000. Minjares v. Phelps Dodge Copper Products (2003). Age discrimination. Arbitration Award $128,448. Every case is different and similar results may not be obtained in your case.